Vizcaya Bridge is the oldest hanging transporter bridge in the world. It was built in 1893 and designed by Alberto de Palacio, one of Gustave Eiffel's disciples. 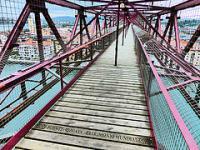 It links the towns of Portugalete and Las Arenas (part of Getxo) near Bilbao, crossing the mouth of the Nervion River. The design was made like this so the passage of ships would not be interrupted. The bridge is made of iron, and uses twisted steel cables (by Ferdinand Arnodin). The first gondola here was operated by a steam engine. The bridge is 164 meters long and its gondola can transport six cars and several dozens of passengers in one minute and a half. The pillars of the bridge are 50 meters high. People in the area commonly call it the Puente Colgante (literally "hanging bridge"). It is still in use. It operates every 8 minutes, 24 hours a day all year round. The Puente Colgante is located just north of Bilbao, not far from the motorway. I visited it from the Portugalete side. It was quite difficult to find a parking spot close by. Eventually I decided to drive on for a while (farther up north), until traffic got less dense. There's a boulevard along the river that you can follow back on foot. 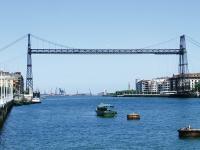 The bridge actually is right in the center of Portugalete. Like others have noticed: the bridge bears a strong resemblance to the Eiffel Tower. It keeps attracting your view. It is grand and lean. The gondola that hangs and moves underneath looks like a little boat that is pulled back and forth. Since 1999, the pillars of the bridge on both sides have lifts installed. These will take you up 50 meters, from where you can walk over the bridge's platform. At first instance, it looked like an interesting thing to do here. So I bought a ticket to the lift for 5 EUR. I got weak knees however when I looked up from below: the bridge looks so thin and scary! I entered the lift, but on the way up I told myself that I would go back down with the same lift immediately. I think it scared me because the construction is very 'open': you can see right through everything, so you also see all the depth and height. Arriving at the top, the feeling wasn't so bad anymore. They have the upper platform totally encaged, and you cannot look down below your feet. I even started enjoying it! One can walk all the way to the other side of the bridge, to Getxo. When a gondola is passing underneath, you can see the cables rolling and feel the construction trembling. In all, I found it a worthwhile WHS to visit. If you're really afraid of heights you can always take the gondola to the other side! 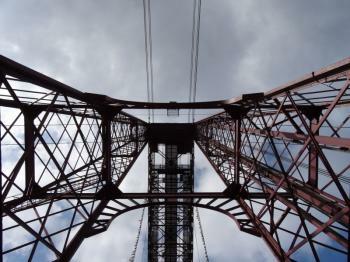 In 1893, Vizcaya Bridge was built at the mouth of the busy Nervion River, just 11 kilometers away from Bilbao. It was meant to connect the sides of the river without disrupting the shipping traffic coming in and out of Bilbao, which was at the time Spain’s biggest port. The man who was tasked with the project was Alberto Palacio, one of Gustave Eiffel’s students. Just like his mentor’s famous tower, Palacio’s creation may have been imposing initially, but quickly became an attraction and a symbol of the city. The solution that Palacio has come up with was a transporter bridge with a gondola shuttling back and forth between the banks of the river. The gondola service has been running non-stop since the construction of the bridge and was famously interrupted only once when the architect saw his creation partially destroyed during the Spanish Civil War. The bridge is easily reachable by public transit from Bilbao. The ride on the gondola costs only 40 cents and lasts less than two minutes. If you have the time, I strongly recommend visiting the adjoining town of Portugalete for leisurely strolls on the cobble-stone streets and spectacular views on the bridge and river. I, for one, like the steel monsters such as Vizcaya bridge. My wife however couldn´t care less. What she does like is laying on the beach getting a tan. So when I told her that we `had` to see this hanging transporter bridge I made sure to tell her that sea and sand were around the corner. Besides that, it wouldn´t take too long to see a bridge would it? Only than she was willing to go. Quid pro quo sort to speak. All in all I had a nice `tick` and, for those who worried, I made it up with my wife as well. Bilbao is only a ten minute drive away and is anice city full of cider and pintxos bars. Something we both like. We had a great day spending the rest of our time drinking and eating the Bask tapas. The town´s cathedral is part of the routes to Santiago in Spain, another WHS, so we did have a look as well overthere. We finished our day at Gehry's worldfamous Guggenheim museum, a building I had in my missing top 50 sites. I visited this WHS in August 2014. I decided to visit from the Portugalete side as there is an indoor parking just next to the bridge. 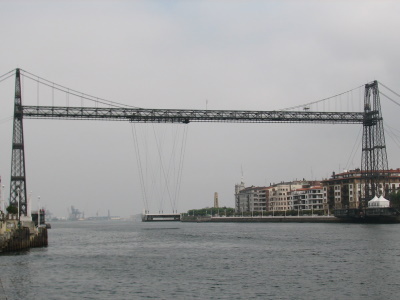 The "Puente Colgante" connects Portugalete to Getxo. For 7 euros I got a lift to the top part of the bridge (an back down of course!) and I walked from one side to the other. In the middle of the bridge a UNESCO flag was hoisted and on the bridge itself there were information boards on the history of the bridge as well as on other WHS around the world. The transporter bridge works non-stop and it carries a maximum of 6 cars + pedestrians for a minimal fee. I guess local pedestrians prefer using the cheaper ferry boat service however it's a great option when travelling by car. The highlight of my trip was experiencing the transporter bridge in action from high above and being able to feel every squeak and vibration as if it were coming to life. One last tip: don't forget to have a look inside the bridge gift shop; behind the ticket vendor there is the original UNESCO inscription certificate! I crossed the river in the gondola for 3 euros. 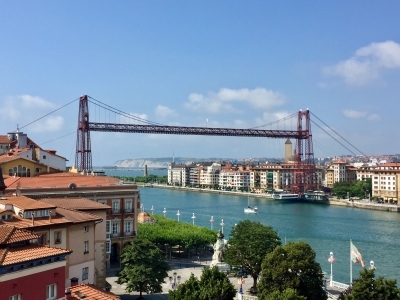 I travelled by local train from Bilbao Abando station to Portugalete enjoying a spectacular view of the bridge while approaching Portugalete station. Having crossed the bridge I went to the nearby Areeta metro station to catch a train back to Bilbao and the Guggenheim Museum. I believe that this is the world's last remaining operating transporter bridge; I have only seen one other, derilict at La Boca in Buenos Aires, Argentina. This is really a nice experience. Built by Ferdinand Arnodin, a friend of Gustave Eiffel, the bridge construction reminds one of the Eiffeltower. It's actually an aerial bridge, a horizontal cablecar on which you drive or walk on. It has been carefully refurbished and it's really an experience to cross the river Nervion 'aboard' this bridge. As it fits only a small number of vehicles you may have to queue if you want to use it by car.